Every child loves to have their very own stool, and all kids love to do puzzles, so this is a winning combination! 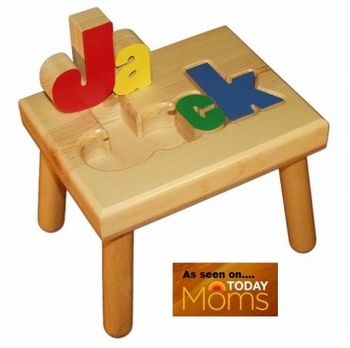 Our unique puzzle step stool seat helps children learn perception, problem solving, and helps them learn to spell their name. It’s made here in the USA from solid pieces of natural wood. The seat is 9 inches above the floor and the seat surface measures 9 by 12 inches. For an even more personal touch you can engrave a keepsake message or birth details on the bottom of the stool. See More Images above for detailed pictures of the engraving option. Also, please note that the engraved area is limited to 9 lines with a maximum of 30 characters per line and a total of 300 characters including spaces. Also available in pastel colors. Click here to see it. Name can be 8 letters maximum, 7 letters maximum with two names or if the name contains 2 capital letters. We also have a larger stool which can accommodate up to 14 letters: Click here to see the larger stool. Why not have one available for the bathroom so child may reach the sink for convenient hand washing? Makes a terrific first birthday or holiday gift as well! I used this name stool puzzle as a baby gift and the parents absolutely loved it and thought it was adorable. The one I had when I was little though did have a bit more finish on the top of the stool, but still a great gift. I purchased this cool stool for my son's first birthday, and he fell in love with it instantly. He loves to puzzle his name on it every chance he gets, and the look of satisfaction on his face after completing his puzzle name is just awesome. Totally love this puzzle stool. ProsThe personalized message engraved in the stool makes it a wonderful gift. This stool is awesome! Looks like it will last forever, colorful and very well put together.The parents were thrilled when they opened it! I'm so glad I bought this and I love the free shipping here. Thanks! ProsSolid product - will last a long time!